As I'm starting to get into making cookies, I thought this recipe might be interesting to tackle. I came across this on a friend's Facebook post and trailed it back to the original site, Cook n ' Share. I took the recipe and made some tweaks on it following tips on creaming fats and sugar I learned a while back. Lately when baking I've been substituting leaf lard for a little less than half of the amount of butter called for in recipes that use it softened for creaming or alternately ice cold for pie crusts. It adds a mouth feel and texture that is hard to describe but definitely distinctive - and addictive! Follows is the creaming method I've been using regularly for a while now. I find it results in a better dough than simply throwing all of the sugar and butter in together before beating. Add the softened lard to bowl of a kitchen mixer. Beat at medium speed until the lard is smooth, about 1-2 minutes. Stop the mixer and add the softened butter. Beat again at medium speed until the butter is well incorporated and smooth. As the mixer is running, drop the sugar in a bit at time until well incorporated, then add the eggs one at a time until also well incorporated then add in the vanilla. If you're only using butter, beat the butter first until smooth then add the sugar and eggs as described above. In a separate bowl, combine the flour and baking soda. Whisk them until they are well incorporated. Add the dry mixture to the wet mixture and fold them together. Add in the chocolate chips and use a spoon to mix them into the batter. Scoop out about a tablespoonful of the batter and flatten it out into the palm of your hand. Add about ½ a teaspoon of Nutella into the center. 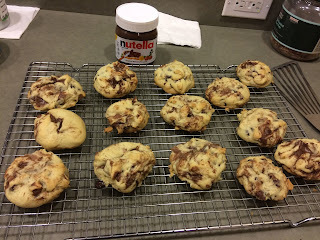 Gently fold the cookie dough back up so it entirely seals and covers the Nutella. The dough proved to be rather sticky for me but washing my hands a couple of times through seemed to help. It took me a few cookies to get this part down but everything turned out well regardless. Place the cookies on a greased cookie tray or a Silpat and place them in the preheated oven for 12 -14 minutes. Remove them from the oven and place them on a wire rack to cool.